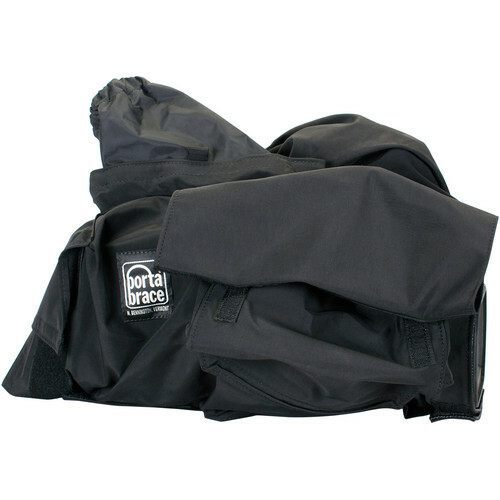 Take advantage of this Rain Slicker from Porta Brace to protect your Sony PMW-300 or PMW-300K1 camcorder from inclement weather. The resilient exterior is made of nylon, while the interior is lined with a soft tricot material that will help prevent unwanted scratches and smudges. The nylon exterior is both water-repellent and breathable, so while your camera is covered, it won't overheat. Clear vinyl windows and strategically placed openings for control access allows for easy operation without letting moisture in. Openings for the lens and the viewfinder are secured with a drawstring to ensure a tight fit. Box Dimensions (LxWxH) 11.6 x 10.6 x 2.4"
RS-PMW300 Rain Slicker for Sony PMW-300/300K1 Camera is rated 5.0 out of 5 by 4. Rated 5 out of 5 by Francisco G. from Perfect Cover Great price to protect a $7,000+ camera! For those who have to film in the rain (Doc, ENG and Event work) this is a must have to protect your gear. Little hard to get to the buttons but that is to be expected with any camera cover. Rated 5 out of 5 by John from Great Camera Protection Just about to head to the wettest place in New Zealand to film, and I needed protection for my Sony 300, sometimes rainfall is measured in feet. Rated 5 out of 5 by Paul from Porta Brace Rain Slicker An absolute essential for shooting outdoors in unpredictable conditions. Rated 5 out of 5 by JEAN CHARLES G. from Perfect rain cover for PMW-300 Used it under heavy snow, protects the camera well. I would recommend.